To the surprise of no one, Microsoft's upcoming Age of Empires Online isn't as "free to play" as once thought. In fairness, yes, technically the game can be free to play. However, a new press release issued by Microsoft, lays out the options available to players willing to outlay a bit of cash on the game, and the reality looks grim for those hoping to enjoy gratis content. Come August 16, PC gamers will be able to download Age of Empires Online from the Games for Windows website for no charge. That's not news. What is news is that for $20 -- a cost applied either directly, or via the purchase of the newly revealed boxed retail version of the game -- players will be granted a "Premium Civilization Pack." The pack includes "rare and epic gear," unique units, extra in-game cash, an unlocked tech tree and a host of useful civilization bonuses. In sum, that means players who are spending money are going to have very tangible in-game advantages. That, in turn, pushes players who originally wanted to go the free route into purchasing the Pack just to keep up and so on and so on. The capitalist motives are respectable, but you can see how it might quickly unbalance the game's online landscape. It should be noted however, that the Premium Civilization Pack isn't the only for-cost option open to players. 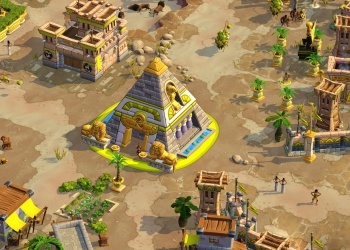 Additionally Microsoft has announced $10 "Booster Packs," which offer a new co-op gaming mode, and $5 "Empire Extras," which is quite literally a collection of fancy bushes and statues for those who want to add a bit of flair to their civilization. Like I said, I can respect the motivations here, but I'm very interested to see how it works out here in reality. The Age of Empires series has a legion of die-hard fans, but I don't know if that's enough to counter the impending rage Microsoft is facing by virtue of this cash grab. How does this sit with you? Is the game now irreparably tarnished with greed, or does this just offer more play options for the really dedicated fans?